How do you select the best chemical suit for the job? 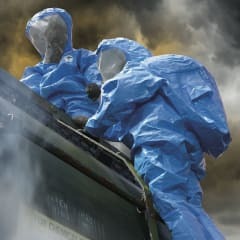 Selecting the best chemical suit for the job is not only about ensuring workers are appropriately protected. It’s also about ensuring their comfort is optimised and your PPE spend is minimised! Neither is it only about confirming a suit is certified to an EN or other standard. Standards make a good starting point, but every application is unique, and there may be a variety of factors relating to the chemical, the task and the environment – often not addressed by standards – that should be considered. Lakeland’s guide to chemical suit selection provides a simple guide to the factors for consideration in ensuring you choose the best chemical suit for the job and is available from Lakeland free of charge. The Guide will help ensure your workers are protected, their comfort is maximised and your PPE spend minimised.